​Over one thousand Keystones have been hidden in plain sight around Cape Cod. The Keystones were placed for others to find. We hoped that people would check into website and let us know where the Keystone was found and perhaps a dream it inspired. Hundreds of people wrote to us...and then the Keystones started moving across the country where they were found again. Keystones What does your key open or start or do? 634 .1 A family vacation in the beautiful white mountains! S2537 I found this key outside of my workplace, a skilled nursing facility in North Augusta, SC. After a trying shift, it was a joy to find this colorful key with so much meaning behind it!!! S2591. My son found this stone on the stairway bannister, at the 3rd St walkway, onto Folly Beach, South Carolina. What is the key to the perfect Summer? The key to the perfect summer is spending a week on Hog Island Audubon Camp in Maine (hogisland.audubon.org) seeing Atlantic Puffins and exploring the Maine Coast! S2549 Found on the mainland dock of Hog Island Audubon Camp, Bremen, Maine. The key to a perfect summer is spending time with your family. I live in Colorado so it will be traveling with my family and I back home and then set out again. I found key S2279 and I found it on the Cape Cod Rail Bike Trail. By the winery sign in Harwich, MA. The key to a perfect Cape Cod summer is a summer filled with making family memories. The salty air, sound of waves and sand between your toes are all so perfect for simply doing NOTHING and enjoying time spent with family. I wish the my father were here to once again enjoy his grandchildren playing on the shore, but sadly, three weeks after leaving the Cape (one of his favorite places to be) last summer he passed away. Now, we are building more memories with the next generation of our clan on the shores of the Cape. Keystone #236.1 was found at the corner of West Bay Road and First Ave in Osterville...on the fire hydrant. might the Keystone open in 2016? Thank you to everyone who contributed a dream in honor of MLK Jr.
What dreams does your Keystone unlock? This key opens the door for families to live in our amazing communities without fear of not being able to afford year round housing and healthy food. The dream this key unlocks for my community is peace and freedom. This is the dream because I found it at my school in the corner and when I saw the colors, it reminded me of peace and freedom. Today is April 24, 2016 and would have been my daughter's 40th birthday. While I was putting flowers at her graveside in Little Neck Cemetery in Marion Ma I found your stone and I showed it to my other daughter and automatically felt something. I showed her and she said well, perhaps you should put it back, so I did. When I got home, I looked up your website and my husband took me back to get the stone. Thankfully it was still there. It has 2 keys on one side and the other has your website plus the number 125.2 I was very emotional visiting Sarahanne, but now that I did go back and get the stone, I feel somewhat at peace. My dream is to one day own my own house with my son and husband. I know its not a big dream but its my dream and with this stone that I found I hope it can help make my dream come true I'm not sure which Keystone but I found it at Olive Garden in Hyannis. There are cool people here. They inspires me to slow down and take a better look at things. I am the program coordinator for The Learning Path, an education/workforce development program for women transitioning back from incarceration. The key idea of the program is that everyone can improve their life through education and everyone deserves a second chance. The Learning Path helps women go back to school or training so that they can find a job or career that they love and that gives them the ability to live independently. My key was found at the Woods Hole Science Aquarium, in Woods Hole, MA. Bumper is a blind seal and that is unable to be released and lives here in Woods Hole at the oldest marine aquarium in the country! In the picture with the key stone, you will see that Bumper's eyes appear blue. He was attacked by a shark and had an infection in his eyes, which made him blind. Though you would never know it from all the cool things I saw him do. You absolutely should come to see Bumper, he is pretty amazing. Each key is special and unique, like each of us. Embrace and respect the differences of others. If you give them a few moments of your time you may discover they could be one of the greatest gifts you could ever imagine receiving. March 18 #807-1 Woods Hole Science Aquarium, in Woods Hole, MA. This is a wonderful country of diverse peoples but we have a lot to learn about accepting one another and living cooperatively. Americans will benefit from a more open system of community inclusion for all; here on the Cape, in New England, nationally and internationally. I dream of communities where the standard is true mutual support, real effort to understand each other and a strong emphasis on consideration and kindness to all. I actually volunteered to place 10 stones. Being more of a skimmer than a reader, I missed the fact that the bag contained 11 stones, and that I was supposed to keep one and place the others. So I placed all 11 on the rail trail in Harwich. It has been almost two months, and it seems like all of the stones have been discovered except for this one. So today, I took it. It was the first one we placed back in December. It is likely not the one I would have chosen from the bag, but it is apparently the one I was meant to have. It is a larger rock, with two key images on it: one square & blue, the other round & orangey - red. This key stone represents for me the need for collaboration and partnership. I will keep it on my desk as a reminder to reach out for and accept help from the very capable others around me. Thank you, Lenore, for creating this project. I just moved to Massachusetts for a new start. I'm hoping that I'll be happier here. Seeing the sunshine within yourself, after the dark days. This key will symbolically represent to me the unlocking of all the potential my young son has--not that he really needs that much help! By extension, I wish it to represent the unlocking of every child's potential. My 7 year old daughter found it and said that, "It was special, I liked the colors on it. I wondered who made it." I hope these keys unlock the doors to homeless people being better able to get the help they need. There are no real borders that love and compassion cannot pass through. We are all connected! My hope is that this keystone releases my family from grief and unlocks my heart's desire, whatever that may be! The past few years have been challenging and finding this keystone reminded me that it's okay to seek and experience joy and that it's most often found, like a little keystone, when not being sought and in the little things. Fresh snowfall. The pristine white beauty of a winter day on Cape Cod. A pretty little curiosity of a stone unexpectedly found in the branch of a tree on an afternoon's walk. All you need is LOVE !!! A little luck doesn't hurt either. My hopes for the future would be for kindness to be our #1 focus in life. "Be kind to unkind people. They need it the most. " My wish for our Cape Cod community is to please keep it clean. The miles upon miles of trails around the Scorton Creek area are beautiful. My hope would be that people visiting this region will care more to pick up their own trash. It's picture perfect out here and we need to keep it this way. Feb 3 087-1 was found on the rocky portion of Gray Gables Beach in Bourne. While walking my dog Willy this morning, I found a beautiful pink scallop shell and a keystone, both of which will find a place on my mantle. We found these 2 rocks at our favorite beach in Provincetown. My 12 year old daughter and 2 year old daughter were thrilled. My 12 year old said it was calming for her to rub the rocks in her hands and they inspired her to look around and explore her world more. My 2 year old said they were "nice, pretty." Happiness. My 8 year old found the Keystone in a tree and it made him very happy like finding lost treasure. My hope for this keystone is not for me but for many people to find a permanent home. To be able to move forward from whatever put them in the situation they are in today. To see a future instead of misfortune. I will be placing my stone in an area where I live in South Yarmouth. Feb 1 I found 876.1 at the Dog Park in Dennis. I've been reading about the Key Projects and was thrilled to find #224.1 as I began a Millway Beach walk that I'd hoped would revive my spirits after a not-so-good week. It was, and will be, a tangible reminder that I just need to be open to joy and it will be there, waiting for me. Thank you! This key unlocks the doors to imagination, it shows you that the sky is the limit. Anything is possible! This key unlocks the door of love for people everywhere.it also unlocks the key to friendship and reliability. I love this project! I am hoping it opens the door to my intuition and inner knowing. Jan 30 I chose this rock #514.1 from the bags I got to place around Orleans. This key I hope unlocks the shackles that this community continues to bind itself in with the ideology of "this is how it's always been." We need a world where new ideas and taking chances aren't frowned upon so that we may continue to grow as a society. This key unlocks my wishes for world peace, people to have houses and clean water to drink. My key will open the door to unconditional love. This is something I was taught by my Mother many years ago. Through the years we may forget some of the best advice ever given. Sometimes the simplest of ideas are really the most important. This key will open that door again and I'm walking in!! Had a nice long walk today at Town Neck Beach and ended it with a stroll up and down the Boardwalk. I am going to re-hide this somewhere else now - fun project. My key is a symbol of faith in a frantic life. I've been so busy with job search and last-minute dashes. On January 28 I had a rare hour off. It was a magnificent day for winter -- warm, bright, windless. I went to Kent's Point in Orleans, just to get away from stress and find peace and purpose in the woods. I knew it was the right move. I had faith, I believed all of the things I was doing were heading me in the right direction. And then there it was, on a wooden bench overlooking Frost Fish Cove. I dream my key would unlock a world for my son with less hate, racism, & judgement. More love, creativity, understanding - a place he can thrive, teach others what is important in life, and be exactly who he was created to be. My hope for this key is that it unlocks a sense of inner peace in my life as I move forward into a new year, a new semester, new personal goals and new opportunities. May it bring me the clarity of thought to live the life I've imagined. The key to change. The key to my future. The key to my first home. The key to unlock the courage to move ahead in my dreams to be with someone I love. As I close in on retirement age, just want to continue to have good health to be able to enjoy this wonder of nature called Cape Cod. Looking forward to cycling, hiking, and kayaking all around this great area. I hope this finds me peace. I'm a GWOT veteran and recently moved back to the Cape. I've struggled with depression for the last ten years, and not long ago put a gun to my head. I hope to find peace and purpose, meaning and another sunrise. My key is: "The key is gratitude. Everything is exactly as it should be" and for me it is. I am living the dream and life is good. I am grateful for all I have and try to appreciate it every day. To be happy again..... And have a home. Returned from the Caribbean on a blustery day and headed to Market Basket for the dreaded task of grocery shopping only to find a misterious rock . The rock was ice cold from being outside. As i stood in the cold i realized that a ray of sunshine is available to you everyday you just need to find it. I volunteered to place keys. One in the bag was ours to keep. I saw one that usually I wouldn't pick, I'm someone who pick's blue, purple turquoise and this one was orange, yellow, but for some reason I felt it was for me. When I turned it over, the number on the bottom was 715, my mom's birthday. Just the day before I was telling her how much I missed her and wished she could send me a sign she was at peace. So, believe it or not, I know what it was. It unlocks the doors of ideas and freedom from the ordinary, the mundane, the insignificant and all the fears of living fully! Jan 18 404.1 In the bag of stones I then distributed in Provincetown. ​My dream is publishing some of my children's stories. 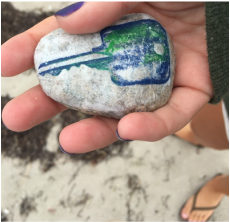 We found the Key Rock at the Hyannis Community Center after my niece had gone ice skating. She is nine years old and had only skated a few times before. She got out on the ice and worked hard to develop her skill. She has overcome a lot of adversity in her life. I want to dedicate the rock to her continued courage and incredible growth. Set your goals and know you can do whatever you want in life!! Finding this keystone encourages me to contribute as much beauty as I can in the world before I leave it. Hopefully a hole in one at disc golf. Jan 17 I found keystone no. 792-1 at hole one tee box at Burgess Park disc golf course. We dream of our new life ... moving to Cape Cod after six years in the Midwest. Our new adventure! Long healthy life where my wife and I will see our beautiful adult children and their families succeed in life and love. Also to see our beautiful grandchildren grow and become happy successful adults. Grateful that I am living the American Dream and enjoying our home near Old Silver Beach. On this MLK Jr. weekend I found this keystone rock while walking along the beach. I hope that in 2016 there is no more war and people care for each other. I think this key unlocks future opportunities for my wife as she pursues her passion for research in the marine biology field. We love the key idea project and we are taking this key as a sign of good omen for the future. Jan 17 We found key number 332.1 at Saint Josephs Church on the window of the Bell Tower.. The dream this key unlocked for my world is Equality and Peace. Jan 17 602.1 Found at the parking area of Scorton Creek . I read the "Keystone" article in the Barnstable Patriot (1/15/16). That afternoon my wife, Carole, and I drove to Millway Beach parking area, which we do regularly because we live on Millway. As a lark, I got out of the car and there was a Keystone on a granite bench engraved, "In Loving Memory of Denise St. Pierre Harrington." Carole was surprised, but then discovered s stone on a nearby fence post. Printed on the stone was, "Surround Yourself With Positive People." Printed on the reverse side was, "#The Kindness Rocks Project." My fond thoughts were about Carole's mom who passed away a few years ago at the age of 99. Kindness personified. We loved her so much. By the way Lenore Lyons, we saw your delightful paintings of keystones at the Cape Cod Museum of Art in East Dennis. 'in loving memory of Denise St. Pierre Harrington. Carole was surprised about my discovery. Later, I fondly remembered Carole's mom, who died at 99 in Texas. Several minutes later when leaving the beach, Carole spotted a smaller stone on a fence post in the parking lot. Her discovery read, "Surround yourself with positive people." The reverse side was inked, "#The Kindness Rocks Project." Jan 15 Dave found Keystone 814.1 on a bench at Millway Beach in Barnstable Village. This key can unlock the door to happiness and love for family members. The keystone dream is to create some thing for people to enjoy love laugh and be happy at. I almost didn't get out of my car, I almost didn't even come to the beach today- I haven't been feeling well. But I thought about what my late grandmother used to say ("don't put off til tomorrow...") and did. I've been ill for a few months and am living at the cape while I heal, and I've been feeling lonely and frustrated lately. Finding this key feels like hope. To me, this key is the key to finishing my book! I wasn't feeling terribly inspired today until I came across it. Hopefully it will give me a little more motivation do complete my grad school applications.